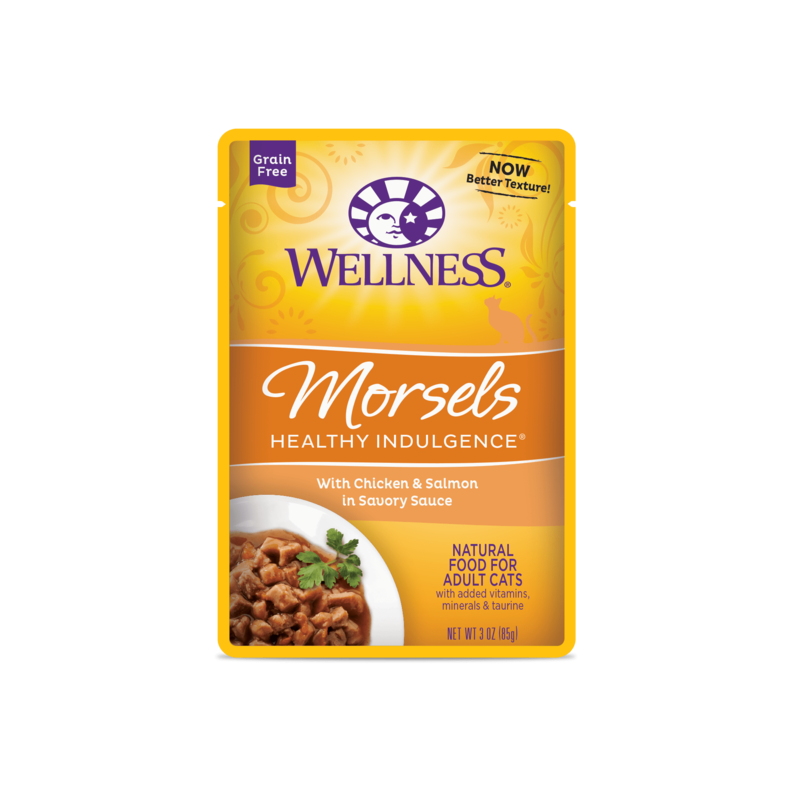 Wellness® Healthy Indulgence® offers a menu of succulent morsels paired with delectable sauces for a taste cats love. Available in: 3 oz. (85g) pouches. › We ensure nutrient digestibility through our Digestool® confirmation studies – less nutrients in the stool, means more nutrients stay in the body. › Cranberries and Blueberries are packed with antioxidant phyto-nutrients that help maintain proper urinary tract health. › Vegetables such as Sweet Potatoesand Carrots provide natural sources of antioxidants. › Flaxseed provides an excellent source of Alpha-Linolenic Acid, and Omega 3 Fatty Acids to help maintain a healthy skin and shiny coat. › Wellness Healthy Indulgence recipes contain no wheat or wheat gluten, no corn or soy, no artificial colors or flavors. › Water is an extremely important nutrient with respect to a cat’s overall health and is one of the most critical nutrients which can help prevent common Feline Lower Urinary Tract Diseases (FLUTD). › Since cats do not have a strong thirst drive, it is important for a cat to ingest water with its food. Feeding Wellness Healthy Indulgence entrées is a healthy and delicious way to help increase your cat’s water intake. Is your cat a food critic? Ours sure are. That’s why we created Wellness® Healthy Indulgence®, a menu of succulent morsels paired with delectable sauces to satisfy even the most refined palate. With taste in mind, but health at heart, we combine real foods such as turkey and chicken to create slow-cooked recipes you can feel good about serving. This is the Wellness Way to enjoy life’s everyday indulgences. 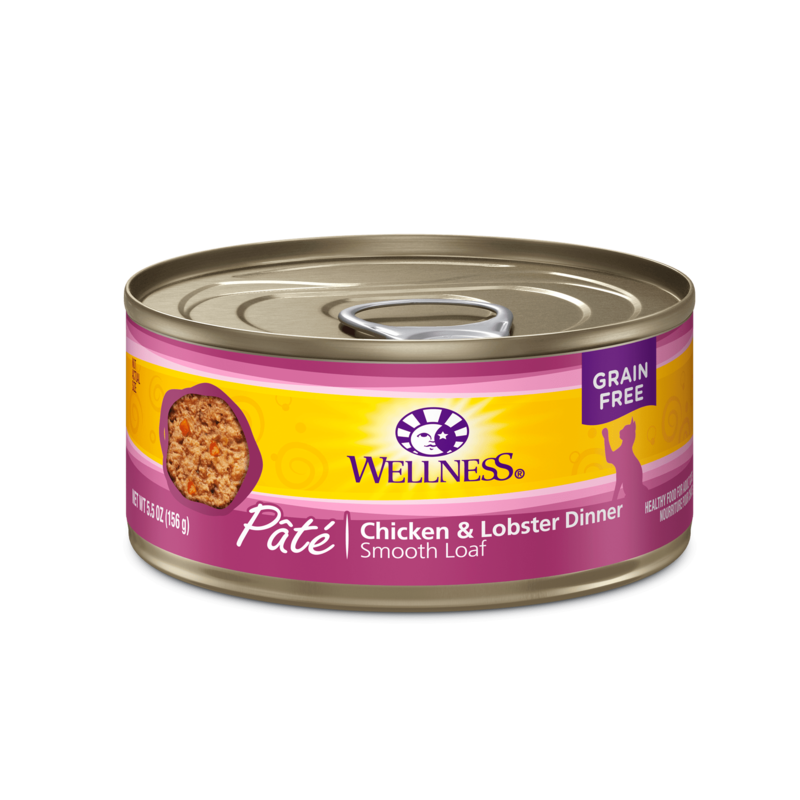 Wellness® Healthy Indulgence® offers a menu of succulent morsels paired with delectable sauces for a taste cats love. The only brand that offers grain-free and wheat gluten-free, natural pouches. Chicken Broth, Salmon, Chicken, Chicken Liver, Egg Whites, Oat Fiber, Natural Flavor, Carrots, Sweet Potatoes, Guar Gum, Potassium Chloride, Tricalcium Phosphate, Squash, Blueberries, Cranberries, Zucchini, Flaxseed, Sodium Carbonate, DL-Methionine, Taurine, Sodium Phosphate, Iron Proteinate, Beta-Carotene, Zinc Proteinate, Vitamin E Supplement, Choline Chloride, Cobalt Proteinate, Thiamine Mononitrate, Copper Proteinate, Folic Acid, Manganese Proteinate, Niacin, d-Calcium Pantothenate, Sodium Selenite, Vitamin D-3 Supplement, Pyridoxine Hydrochloride, Riboflavin Supplement, Vitamin A Supplement, Vitamin B-12 Supplement, Potassium Iodide, Biotin. Feed according to the age, size, and activity level of your cat. Adult cats, feed 170g per 2kg of body weight per day. Adjust as needed to maintain optimum weight. Serve at room temperature and refrigerate unused portion. Please have clean, fresh water available at all times. This food contains 791 kcal/kg or 67 kcal/pouch ME (metabolizable energy) on an as fed basis (calculated). 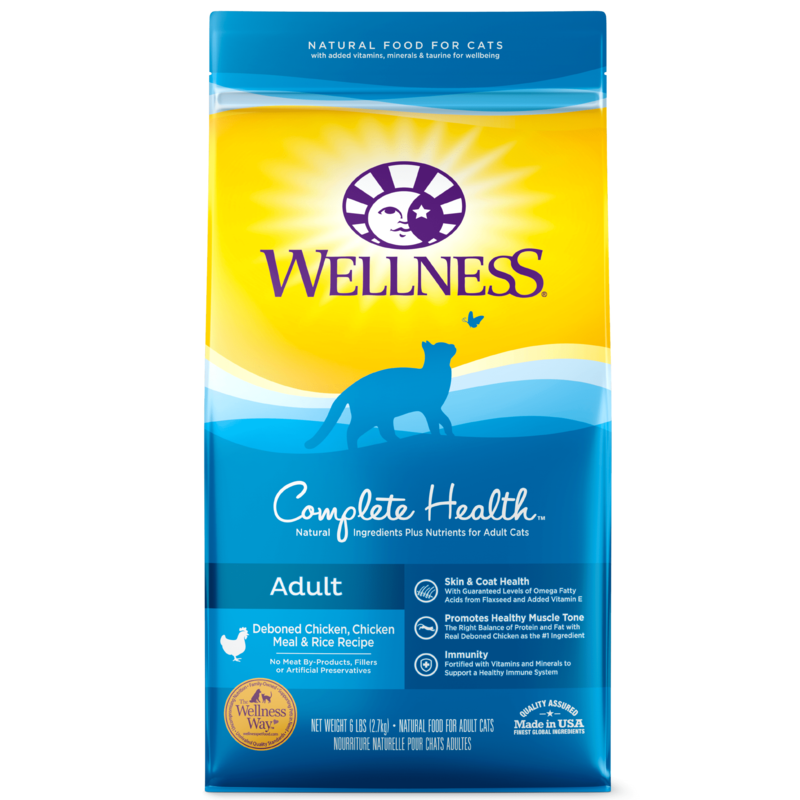 Wellness® Healthy Indulgence® Salmon & Chicken Recipe Cat Food is formulated to meet the nutritional levels established by the AAFCO Cat Food Nutrient Profiles for maintenance.